(May 25, 2009) Next year, the U.S. Census Bureau will conduct the largest peacetime activity that the government manages. During the 2010 Decennial Census, staff will attempt to count each of the over 300,000,000 people living in the United States, count each person only once, and count each of them in the right location. One of the 12 Regional Census Centers that will mange census field operations is located in Steele Creek in Whitehall Corporate Center. The Charlotte Region includes five states -- Kentucky, North Carolina, South Carolina, Tennessee, and Virginia -- and contains approximately 10.5% of the nation's population. This spring the Charlotte Regional Census Center managed about 15,000 field workers who canvassed every street in the region to update the Census Bureau's address list. An accurate address list is crucial to ensure each household receives a census questionnaire in 2010. Next year the Census Bureau will mail questionnaires to every address on its list. Residents will be asked to complete the questionnaires and mail them back. If they don't, census enumerators will visit them and complete a questionnaire. This Nonresponse Follow Up operation is the largest and most expensive census operation. The Charlotte Region will hire approximately 50,000 employees to conduct the Nonresponse Follow Up operation and related activities in its five-state region. 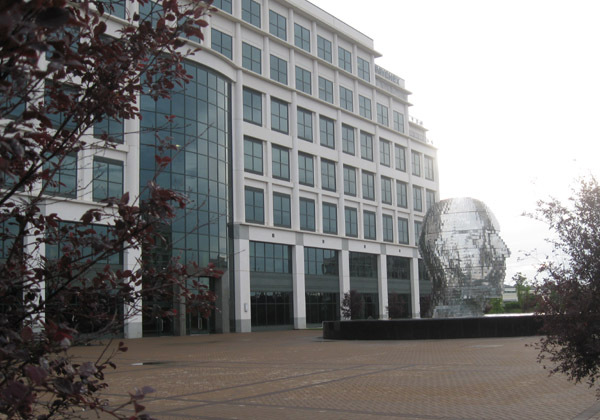 Metalmorphosis, a sculpture by Czech artist David Cerny, sits in front of the building in Whitehall Corporate Center where the Charlotte Regional Census Center is located. View the Live Web Cam. The Charlotte Regional Census Center is a temporary office opened just to manage the 2010 census. It opened in early 2008 and will close in 2011. It occupies the second floor and part of the third floor of the building at 3701 Arco Corporate Drive. Also located at the edge of Steele Creek is the Charlotte Local Census Office. It was one of five offices in North Carolina that opened early to manage the address canvassing operation. The Charlotte Local Census Office managed field staff in 12 counties. Late this year ten additional offices will open in North Carolina and join the other five offices to manage the more intensive operations to be conducted next year. In 2010, the Charlotte Local Census Office will manage operations in Mecklenburg County only. The Charlotte Local Census Office is located near I-77 and Arrowood Road at the end of Red Oak Lane (behind Ruby Tuesdays). The Census Bureau's Charlotte Regional Office also is located in Steele Creek, on Center Park Drive off Beam Road. The major function of this permanent office is to manage ongoing and one-time surveys. A staff of approximately 600 field representatives throughout the region visit survey respondents to collect information that is used to tabulate unemployment statistics, cost of living rates, crime statistics, health statistics, and other data released by the federal government. For more information, visit the 2010 Decennial Census web site or the Charlotte Region web page. To comment on this story, please visit the Steele Creek Residents Association Message Board.